Clear translations of the Buddha's original teachings Thoughtfully curated selections from the Pali Canon Chapters on the Buddha's life, rebirth, suffering, liberation, and practice A foreword by His Holiness the Dalai Lama In the Buddha's Words allows even readers unacquainted with Buddhism to grasp the significance of the Buddha's contributions to our world heritage. Taken as a whole, these texts bear eloquent testimony to the breadth and intelligence of the Buddha's teachings, and point the way to an ancient yet ever-vital path. Practitioners and scholars alike will find this systematic presentation indispensable. 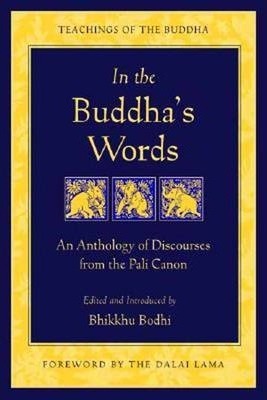 Dive into the world of the Buddha through these easy-to-read English translations of the Pali Canon. The Pali Canon is the literary, intellectual, and spiritual foundation of Theravada Buddhism. This volume, being organized in a progressive manner "from the simple to the difficult, from the elementary to the profound," makes it well-suited for those looking for an accessible introduction to the Theravadin scriptural corpus, as well as being a valuable resource for those familiar with the Pali Canon but wanting a more structured presentation of the materials. Ven. Bhikkhu Bodhi is an American Buddhist monk from New York City, born in 1944. He obtained a BA in philosophy from Brooklyn College and a PhD in philosophy from Claremont Graduate School. After completing his university studies he traveled to Sri Lanka, where he received novice ordination in 1972 and full ordination in 1973, both under the leading Sri Lankan scholar-monk, Ven. Balangoda Ananda Maitreya (1896-1998). From 1984 to 2002 he was the editor for the Buddhist Publication Society in Kandy, where he lived for ten years with the senior German monk, Ven. Nyanaponika Thera (1901-1994), at the Forest Hermitage. He returned to the U.S. in 2002. He currently lives and teaches at Chuang Yen Monastery in Carmel, New York. Ven. Bodhi has many important publications to his credit, either as author, translator, or editor. These include The Middle Length Discourses of the Buddha (Majjhima Nikaya, 1995), The Connected Discourses of the Buddha (Samyutta Nikaya, 2000), and The Numerical Discourses of the Buddha (Anguttara Nikaya, 2012). In 2008, together with several of his students, Ven. Bodhi founded Buddhist Global Relief, a nonprofit supporting hunger relief, sustainable agriculture, and education in countries suffering from chronic poverty and malnutrition. Tenzin Gyatso, the Fourteenth Dalai Lama, is the spiritual leader of the Tibetan people. He frequently describes himself as a simple Buddhist monk. Born in northeastern Tibet in 1935, he was as a toddler recognized as the incarnation of the Thirteenth Dalai Lama and brought to Tibet's capital, Lhasa. In 1950, Mao Zedong's Communist forces made their first incursions into eastern Tibet, shortly after which the young Dalai Lama assumed the political leadership of his country. He passed his scholastic examinations with honors at the Great Prayer Festival in Lhasa in 1959, the same year Chinese forces occupied the city, forcing His Holiness to escape to India. There he set up the Tibetan government-in-exile in Dharamsala, working to secure the welfare of the more than 100,000 Tibetan exiles and prevent the destruction of Tibetan culture. In his capacity as a spiritual and political leader, he has traveled to more than sixty-two countries on six continents and met with presidents, popes, and leading scientists to foster dialogue and create a better world. In recognition of his tireless work for the nonviolent liberation of Tibet, the Dalai Lama was awarded the Nobel Peace Prize in 1989. In 2012, he relinquished political authority in his exile government and turned it over to democratically elected representatives. His Holiness frequently states that his life is guided by three major commitments: the promotion of basic human values or secular ethics in the interest of human happiness, the fostering of interreligious harmony, and securing the welfare of the Tibetan people, focusing on the survival of their identity, culture, and religion. As a superior scholar trained in the classical texts of the Nalanda tradition of Indian Buddhism, he is able to distill the central tenets of Buddhist philosophy in clear and inspiring language, his gift for pedagogy imbued with his infectious joy. Connecting scientists with Buddhist scholars, he helps unite contemplative and modern modes of investigation, bringing ancient tools and insights to bear on the acute problems facing the contemporary world. His efforts to foster dialogue among leaders of the world's faiths envision a future where people of different beliefs can share the planet in harmony. Wisdom Publications is proud to be the premier publisher of the Dalai Lama's more serious and in-depth works.